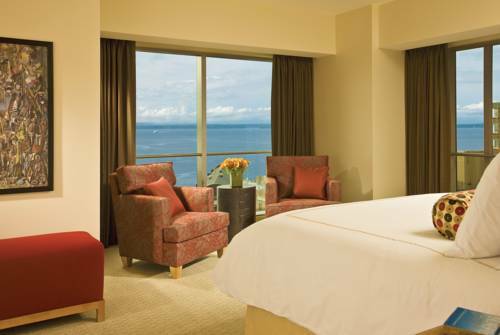 Enjoy stunning Elliott Bay and Puget Sound vistas from your luxurious downtown Seattle hotel room or suite and world renowned attractions on the hotels doorstep. At Washington states only Forbes Five Star hotel sleek modern interiors crafted of wood and stone bring the Northwest inside while local artwork showcases the citys creativity. The Four Seasons Hotel Seattle is positioned on the first 10 floors of a 21-storey hotel and residential tower only steps from the Pikes Place Market- Seattle Art Museum and Benaroya Hall. It is located in the heart of the business and shopping area of the city. Complimentary town car transportation within a 2-mile radius of the hotel excluding the cruise ship terminal is available.